Christopher Nolan was in Las Vegas today to show off his latest sci-fi epic to theater owners at CinemaCon. While those in attendance expected to find out something new about the movie, the director remained tight-lipped about Interstellar and its storyline. He did, however, issue a stern warning to those in attendence about its presentation in theaters later this year. Paramount will release the movie on November 7th. And Christopher Nolan hopes that theaters are extremely diligent in showing the movie in the way it was meant to be seen, claiming that it's presentation will be more important than any film he has ever done. ""We shot quite a lot of the film in IMAX, more than we had ever done in the past. There will be some really beautiful IMAX film prints that will be in certain key locations. And we are really maximizing the various technical capabilities out there, particularly in the sound mix. We have very ambitious plans in how we are going to take a very big approach as to how we maximize the potential of the existing sound system in theatres...using existing equipment, you don't have to buy anything new. Really what we are attempting to do is give audiences a better experience, an immersive experience. We are looking to theatre owners to really transport us and give us the best they can in how we get that out to the public. As they say, the projectionist has the final cut. I really think on this film the technical aspect of how this film is presented is really going to be more important than on any film I've done before, so that means getting into partnership with the studios and theatres." 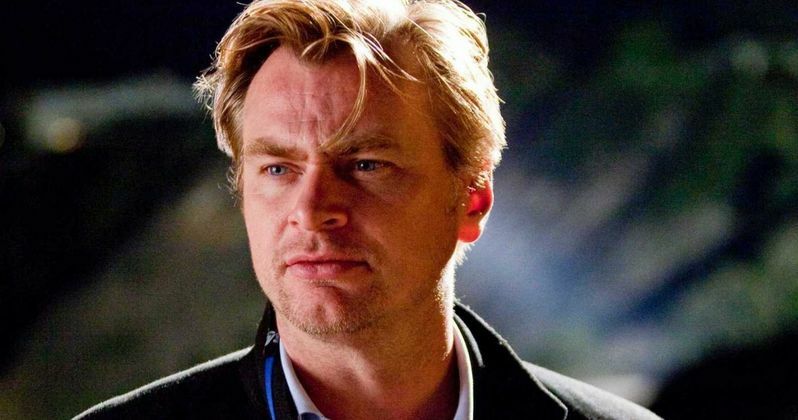 Christopher Nolan went onto talk about the importance of shooting on film, claiming that it was not for nostalgia reasons, and that he has not abandoned digital filmmaking. "I am not committed to film out of nostalgia. I am in favor of any kind of technical innovation but it needs to exceed what has gone before and so far nothing has exceeded anything that's come before (meaning film)." Interstellar will not be presented in 3D. Christopher Nolan continued his presentation, explaining why. "It's just not right for films I want to do." The director went onto explain his motivation behind taking on the project. "It's been really an interesting challenge to me. I've been really enjoying it. I grew up in the era that was pretty much the golden age of the blockbuster when something being a family film could be very broad based and universal in its appeal and I feel that's something I want to see again. Something that really looks at where we are as people, where we might go, something that tries to address the human experience...For me it's really like harking back to the kinds of films I grew up with, that took me to places I could hardly imagine." The director is still editing Interstellar, a process he calls his favorite part of filmmaking. Its his wish to keep the whole thing under wraps for now. He did praise Matthew McConaughey's performance in the movie, calling him an 'everyman'. He promised that moviegoers will be able to see the story through his eyes. And that it was Matthew McConaughey performance in Mud that led to his casting. About the story, he only had this to say, which is close to what we've been hearing all along. "Really it's about travel to other places we couldn't reach through travel through space because the time expanse is far beyond anything we could conceive of."